Not as good as All the Young Dudes, but even though everything didn’t ring a bell, it started with “All the Way From Memphis” and kept me going – moving and reminiscing to the end. This one is not a Ram contender, but I just like the Mott sound and enjoyed hearing it again. In fact, I think I saw them in concert in my senior year of high school – or tried to – but I cannot remember. Funny, I remember exactly what I was wearing down to the shoes, and that I was with the Dean’s son and another couple. I remember going to my first (and I think only) after hours club, where we went after we did whatever we did. I just don’t remember seeing the group perform. Perhaps they cancelled? 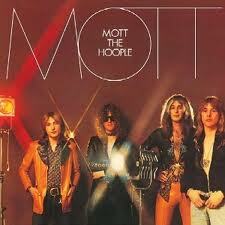 Mott consisted of Ian Hunter, lead singer, writer and arranger; Mick Ralphs, lead guitar and writer on these two and prior albums; and bassist Overend Watts, who was my crush in the band because he had insane hair. Oh and the drummer whose name is Buffin.